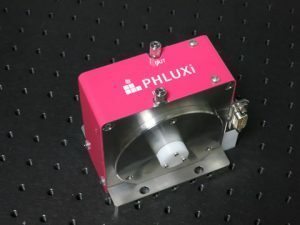 Our THz-wave parametric systems is driven by a diode-pumped laser. This Nd:YAG laser is developed as a pump source for THz systems but it also applicable a wide range of applications. QCW-pumping results high energy pulses whereas the laser is pumped by laser diodes. Diode controller and Chiller are included. General use solid-state laser amplifier module with pumping diode, laser rod, and temperature sensors. They are side-pumped laser core packaged with laser diodes, laser rod, and temperature sensors. They can be used as the laser engine of customer-built laser and the amplifier of existing system. Standard item includes Nd:YAG laser rod and pump diodes for excitation of Nd ions. Ask availability for other material and customized specifications. 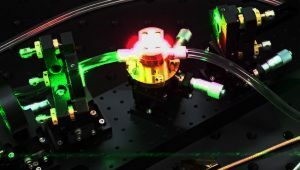 An intracavity defractive tunable filter which is driven by RF signal (Acousto-optic tunable filter: AOTF) is inserted into the laser cavity of tunable laser. Monochromatic laser comes from the laser cavity which constructed for the defracted emission selected by the AOTF. The laser has many advantages; stable, fast scan, quick access, and fluorescence free. No mechanical movement of tuning element brings high stability. The transition time between two wavelength depends on AOTF, it would be less than 1 us for any interval. Easy rejection of background fluorescence (spontaneous emission) from laser medium. PC, smartphone, and handset can be used to control wavelength. Applying 10 W CW laser at 532 nm as a pump laser to Ti:sapphire, typical specifications are as follows. Other material can be applied. Below is few examples of material. Required pump laser and achievable specifications depend on laser medium.